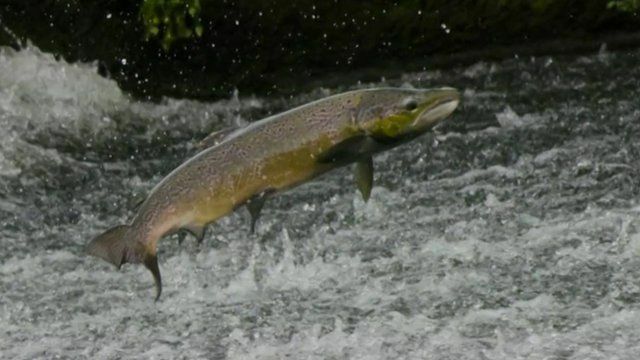 'King of Fish' returns to UK rivers Jump to media player Successful conservation projects have reversed the decline of salmon in many UK rivers, as John Maguire reports. Salmon stock plan warning Jump to media player Plans to halt stocking Welsh rivers with salmon raised in hatcheries will end with anglers being forced to return their catches, it is claimed. At this time of year the fish are swimming upriver to breed and, if you are lucky, you may see them leaping out of the water to overcome obstacles. John Maguire reports from the banks of the River Dove in Derbyshire - one area where salmon are making a comeback.